LEG Trip 4 was successful. Another, Eden, Genmo, Kore, Patino, Phroon, Savior, and Wuzhou. LEG Trip 5 Schedule: Saturday, February 2, 2008. 1pm pacific: This slot is experimental, an attempt to have a time for thoom that cannot make a later time. 7pm pacific: Gather at same spot, same goal as trip 4. Bring Zu, Chains, et cetra. A recent and hot controversy has begun in Puddleby in the last two days. The topic concerns the ability to dye the thoom rill, frill, crest, ah...whatever it's called. Female thoom everywhere are in outrage at this 'racism' in the Puddleby as the beauty salon will except payment for services it doesn't perform! Ruairc needs to be placed in jail! The business in question. This all sylvan business needs to be taken to court! Even Journeyman Mystic, Fogtripper (a fen) gives his support! Discuss it here. We the Thoom encourage you to stand against it, call the sheriff, major, president! Everyone! Introduction, West Keep, and Sarir. Lugubrion says, "We can meet in my parlor." Lugubrion says, Lugubrion says, "We can meet in my parlor." Lugubrion asks, "What is on your minds, honored guests?" Phroon says, "You had dissapeared for longer than as seemed normal"
Lugubrion says, "I have been here all along." Lugubrion says, "I do not often entertain." Miser says, "Some of your own servants seemed concerned"
Miser says, "in the kitchen, particularly"
Lugubrion asks, "What were you doing in the kitchen?" Phroon says, "I must apologize, we are an inquizitive race." Eden says in Thoom, "We have entered the western keep if you could infer..."
Lugubrion says, "An honest race too, I see..."
Lugubrion says, "If you wished food you could simply ask my Sarir. They have been instructed to serve you." Lugubrion says, "I'm very disappointed, you could have been hurt." Lugubrion says, "The Sarir there are not entirely safe." Lugubrion asks, "What did you wish to find, is there anything that I may help you with?" Eden asks in Thoom, "The watery guardians a hazard to them?" Lugubrion says, "The guardians are for your protection." Phroon says, "We were looking for a maze. All your brothers have zodiac mazes inside their keeps." Lugubrion says, "They have a maze, no doubt, to keep inquisitive people out." Lugubrion says, "I'm pleasantly surprised no others have found a way past my barriers. I feared opening the passage." Lugubrion says, "I could have perhaps arranged a tour for you, if I had known it was that important." 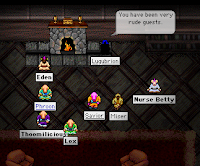 Lugubrion says, "You have been very rude guests." Lugubrion says, "I thought better of thooms." Thoomilicious exclaims, "I've only been in the kitchen!" Lugubrion says, "I'm afraid the kitchen is not as well-stocked as it once was." Lugubrion says, "You say you spoke with the Sarir? They were polite and treated you well, I hope." Lugubrion asks, "All of them were well behaved?" Savior says in Thoom, "they are very polite"
Lugubrion says, "They need not be concerned if they follow my instructions." Lugubrion says, "If they do, the guardians will not...bother them." Lugubrion says, "I have fostered an inquisitive nature in my Sarir." Lugubrion says, "They are trained to be much like thooms." Lugubrion asks, "Unhappy, you say?" Eden says in Thoom, "One mentioned being forbidden from Ethereal studies." Lugubrion asks, "Who said that?" Eden says in Thoom, "A kind Sarir in the library." Lugubrion says, "They are forbidden even from speaking of their studies." Lugubrion ponders, "Perhaps I was wrong to trust that Sarir." Savior says, "they didn't speak of what they studied"
Lugubrion says, "It is forbidden." Miser says, "What he actually said is that few do any studies now"
Miser says, "implying more did beforehand"
Lugubrion says, "Yes, of course." Lox asks, "So, what do they study?" Lugubrion says, "The remaining Sarir studies...or at least studied, whatever it pleases." Lugubrion says, "Except that which is forbidden." Lugubrion says, "The other Sarir are forbidden from study, they have proven untrustworthy." Lugubrion says, "The recent ethereal changes have made their studies dangerous." Thoomilicious asks, "what's not forbidden to study?" Lugubrion says, "That which is not related to the ethereal plane." Miser says, "A first edition of 'The Old Thoom and the Sea', quite a catch you have there." Lugubrion says, "I have read it many times." Eden says in Thoom, "A fine collection of many books in the library too. Many topics covered extensively." Lugubrion says, "Indeed. There is much for the Sarir to study." Lugubrion says, "They enjoy scholarship." Eden asks in Thoom, "What subject does Old Thoom and the Sea cover?" Lugubrion says, "It is a grand story." Lugubrion says, "I would not wish to ruin it for you." Savior asks, "doyou know Trillbane, Lugubrion?" Lugubrion says, "Trillbane? No, I've not heard of any thoom by that name." Savior says, "he is Fen, actually, learned in pathfinding. I have studied all I can from him... and seek to learn more. I wondered if you had ever studied the art of pathfinding?" Lugubrion says, "I have no need of pathfinding." Lugubrion says, "That is useful." Miser asks, "Have you sailed to Peaceton perhaps?" Lugubrion says, "Peaceton...I'm afraid I do not know much of your names. Names change with the centuries." Lugubrion says, "I did travel some in my youth." Miser asks, "To the Mainland?" Lugubrion asks, "To the west?" Lugubrion says, "I believe so, yes. That was many years ago." Eden says in Thoom, "To add to that I one day would like to hear your poetry." Lugubrion says, "My poetry? Oh no, you wouldn't want to hear that." Lugubrion says, "It cannot compare to your great poets." Lugubrion asks, "Would you care for some tea?" Lugubrion says, "I am afraid I am not very prepared to entertain." Lugubrion asks, "What else did you speak of with my fine Sarir?" Lox asks, "So, Mr. Lugubrion. What's been going on with the ether?" Lugubrion says, "The ether has been calming. Although I still feel disturbances...they are diminishing." Lugubrion says, "I have only sensed disturbances with the Annulus. I do hope you are leaving it alone." 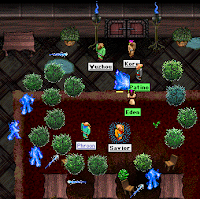 Miser asks, "Have you noted the Darshak activity around Tenebrion's old keep? Lox says, "There was some big booms, and then a crack into the ethereal plane. Miser says, "They apparently stole one of his kyuems and made a mess with it"
Miser says, "blasting a hole right to the annulus, of all places"
Lugubrion asks, "Would you expect another place?" Phroon says, "We are, but the Darshak are playing with it like a child plays with a toy." Lugubrion says, "I have told you, the Annulus is dangerous and not to be fooled with." Lugubrion says, "A child with a toy, that reminds me of some people...fine thoom." Genmo says, "They have built a strange looking kyume"
Lugubrion says, "I doubt an untrained hand can do anything with kyuem but destroy their hand." Miser says, "they did make a hole leading to the annulus already"
Lugubrion says, "Do not be quick to place blame." Genmo says, "You should really take a look at it"
Genmo says, "I know Melabrion has taken over the mind of a Sarir before to do somthing like that"
Lugubrion says, "My Sarir are not as mindless as my brothers." Genmo says, "Send a Sarir on your behalf or something"
Lugubrion says, "It is unwise to let them leave my keep." 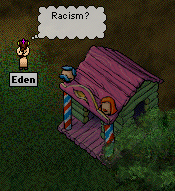 Eden asks in Thoom, "Why?" Lugubrion says, "I have told you, they are not trustworthy." Lugubrion says, "They do not obey the most simple of instructions." Lugubrion says, "I do not have the heart to discipline them as my brothers do." Phroon says, "It worries me that the Darshak have somehow gained some ethereal knowledge, as if overnight." Lugubrion says, "I do not fear untrained minds. I fear partially trained minds, they are the most dangerous." Lugubrion says, "The ethereal flow is closer than it has ever been before, I am sometimes overwhelmed by it...."
Lugubrion says, "But I have not felt anything to be concerned about, except the chaotic storm of the Annulus." Lugubrion asks, "Perhaps they will destroy the island. Do you have any use for it?" Lugubrion asks, "Do you have any moral objections to killing them?" Lugubrion says, "You do that well." Lugubrion says, "I had wondered where my guardians had gone..."
Eden asks in Thoom, "You can produce more guardians?" Lugubrion says, "But it is tiring." Lox asks, "The darshak know a lot about the Astral Plane though. Is that important?" Lugubrion says, "All planes are...important in their own way." Eden asks in Thoom, "the plane of water?" Lugubrion says, "There are many planes with water." Lugubrion says, "Water alone is not very interesting." Lugubrion says, "Water must have earth to flow on." Genmo asks, "What would you say if there was something bad happning with the Geharza plane?" Lugubrion says, "I have enjoyed your visit, but I start to grow tired." Phroon says, "Ah, let me ask one more thing, if I may." Phroon says, "Back when you first attempted to give me a tour of this fine keep…"
Phroon says, "You used a shortcut." Phroon asks, "Have you closed that shortcut?" Lugubrion says, "It is always closed." Phroon says, "We would like to see the ramparts." Lugubrion says, "That is not safe." Lugubrion says, "You may not understand the danger of the Sarir, but it is there." Lugubrion says, "The plane is closer. And the Sarir's curiosity is strong. This is dangerous." Genmo says, "You should give them a good beating just incase"
Lugubrion says, "Violence is not my way." Lugubrion says, "But you should inform me of any..."
Lugubrion says, "I am certain I can trust you." Lugubrion says, "I do hope you will visit again." Note: Trip 1 and 2, and presumably 3 are available for viewing at Phroon's Scroll. And most of my report is viewable at the Sentinel. The highlight of the trip was a discussion with Lugubrion on current and important recent events with the Ethereal Plane. What have Lugubrion's untrustworthy Sarir been up to before their studies were halted? Lugubrion's reaction to finding out that we have entered and talked with Sarir in the western section of his keep. Lugubrion talks about his Sarir and their studies with the Ethereal Plane. Response to Darshak on TI and their schemes but also suitable for us exiles? or maybe even some of his Sarir? Some Sarir in the western keep. Same Place, Same Time. Goal to reach questionable Sarir in the western section/battlements. The team was quite successful for trip 2, but I could not make it. So this is the concluding trip? A last chance of exploration with special equipment that we have obtained (crowbars and shovels). All thoom are invited to participate. Lugubrion's Keep, western keep entrance. 7pm pacific Jan. 19, Saturday. LEG trip 3: the Conclusion?